for mother's day brunch this past weekend we made two different types of mini muffins. 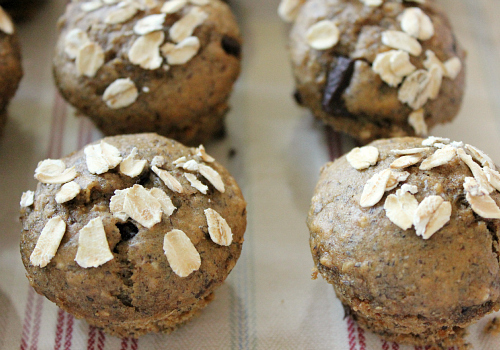 in addition to our mini banana walnut muffins, we also made mini oatmeal flax seed muffins with chocolate chips. these muffins are hearty muffins . . . and they are (mostly) healthy for you too! they remind me a little bit of bran muffins. they have a mixture of white whole-wheat flour and all-purpose flour. 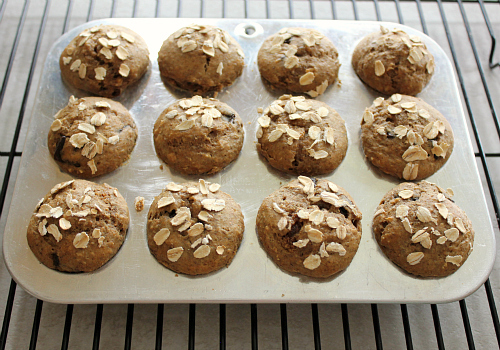 they are loaded with oats and ground flax seed meal too. there is also just a hint of coffee in them which adds a great flavor. to make them just a little bit naughty, we added big chocolate chunks to them. these muffins were super easy to make, and they were ready in no time. they were a great addition to our brunch menu! preheat your oven to 350 degrees F. in a large bowl, sift together both flours. 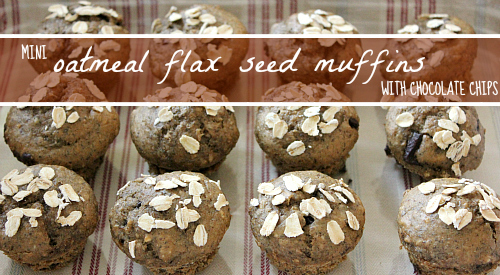 add the flax seed meal, oats, sugar, instant coffee, baking soda, and salt. stir to combine the dry ingredients. add the milk, oil, and egg to the dry ingredients and mix well until all of the ingredients are evenly combined. stir in the chocolate chunks. spoon the batter (approximately 1 tablespoon per mini muffin) into a well-greased mini muffin pan. 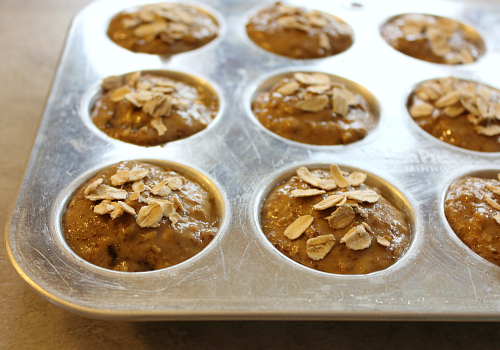 optional: sprinkle additional oats on top of the muffins. bake for 16-18 minutes or until a toothpick inserted into the center of one of the muffins comes out clean. once baked, allow the muffins to cool in the pan for about 5 minutes before removing them from the pan and transferring them to a wire rack to finish cooling.